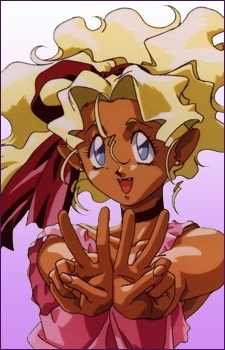 Birthday: November 4 Mihoshi Kuramitsu is a Galaxy Police detective in the fictional Tenchi Muyo! anime and manga series. Her given name "Mihoshi", literally means "Beautiful Star", and is derived from a town in the Okayama Prefecture formerly known as Bisei. In the OVA, Mihoshi is a Seniwan and a member of the Kuramitsu family, whose power is second only to the Jurai Royal Family. Mihoshi is known as one of the finest officers in the Galaxy Police, but her career soon hit a major roadblock after an incident hinted at in the 4th episode of the 1st OVA, and the 4th episode of the 3rd one (it has been alluded that the incident involved an arranged marriage, which would factor in Misao's attack later in the series). It's revealed in the True Tenchi novels, that Mihoshi fell in love with the man she was supposed to marry and he left and broke her heart and she proceeded in commiting suicide and then was revived by the Kuramitsu family, the consequences being her incompetence and her near invulnerability. Mihoshi is actually the great-great-granddaughter of Washu, through her son Mikumo, although this is only stated outside the series itself, and her grandfather Minami Kuramitsu is the Grand Marshall of the Galaxy Police. Mihoshi's mother Mitoto also works for the Galaxy Police, as a cleaning lady. She also has a younger brother, Misao, who had married Mashisu Makibi. Whether her kinship with and ability to constantly circumvent one of the 11-dimensional Chousin goddesses is a sign that she's yet another of the series' transcendental anomalies is unconfirmed at this point. However, it is noteworthy that her mother Mitoto has a reminiscent ability to subconsciously travel vast interstellar distances. Whether she shares her daughter's causuality-bending talent is unknown at this point, but Minami, Mikami and Misao apparently don't. Although she tends to eat and sleep a lot, Mihoshi is very serious about her job in the G.P, doesn't mind helping out with regular household work, and seems better at it than Ryoko or Ayeka. She has been known to write very extensive and unstructured reports... cluttered with details, so it can sometimes take her superiors a while to figure them out. In fact, because her report on the Kagato incident included detailed information on the Jurai royal trees, her report is now TOP SECRET with Jurai Intelligence (Funaho Jurai once confessed to Washu that it took Jurai Intelligence four days to summarize the report). A duplicate report, omitting the sensitive information, was submitted in its place.